1963 20x40 inground renovation ???? Hello to everyone. I have a 20x40 inground pool with steel walls and a cement floor. It's 3ft to a 8ft hopper bottom with a safety ledge. It was/will be again a DE pool. 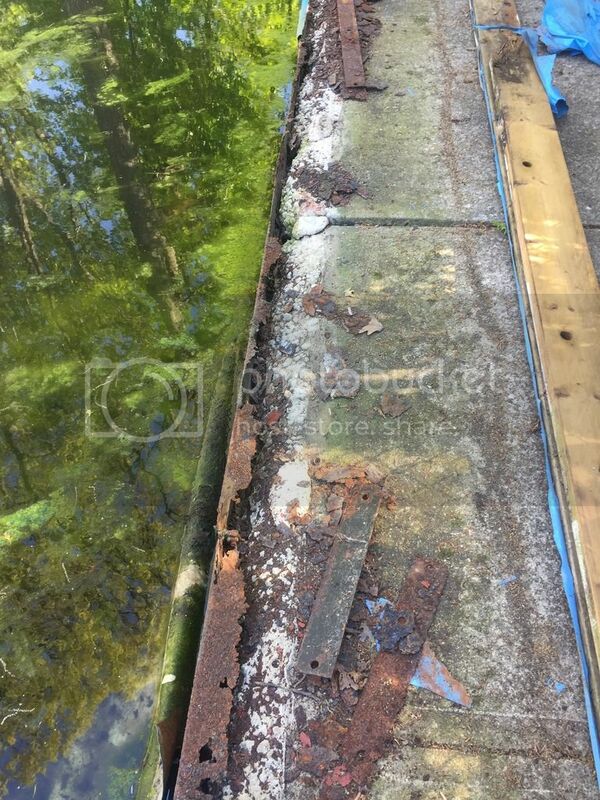 My grandparents but this pool in and I've bought the house and time has come to restore it. 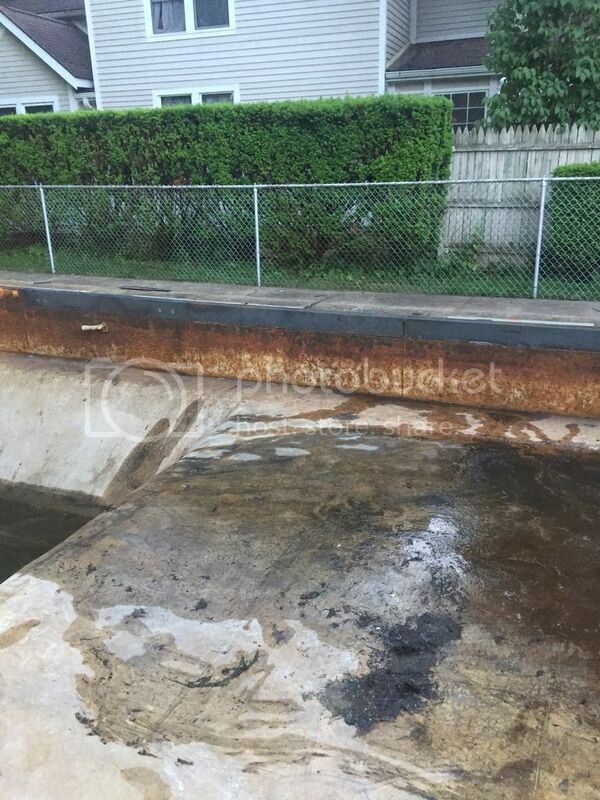 The pool hasn't been open in 20+ years. All the pipes were filled with rv antifreeze and still are. Ok my main question is what do I do with the coping situation. It currently has an overlap liner. Wrapped over a 2x8 which is bolted to the top of the wall (its bent 90deg over the concrete decking) then a white vinyl ribbed coping over that. The coping is above the cement decking. Is it possible to replace this or do I have to go with a track/bead system. Then figure out a coping. Any help is greatly appreciated thank you. Eric. Hi there! What a neat back story on the house/pool! 20+ years of sitting there? Is the pool covered? With the coping I think a picture or 10 will be most helpful so we can see what you are dealing with! This will be a fun one to work on and figure out! Hi. Yes the pool has been covered with the mesh/screen style winter cover the whole time. So it is a green swamp. Is it a eco system with critters and plants? 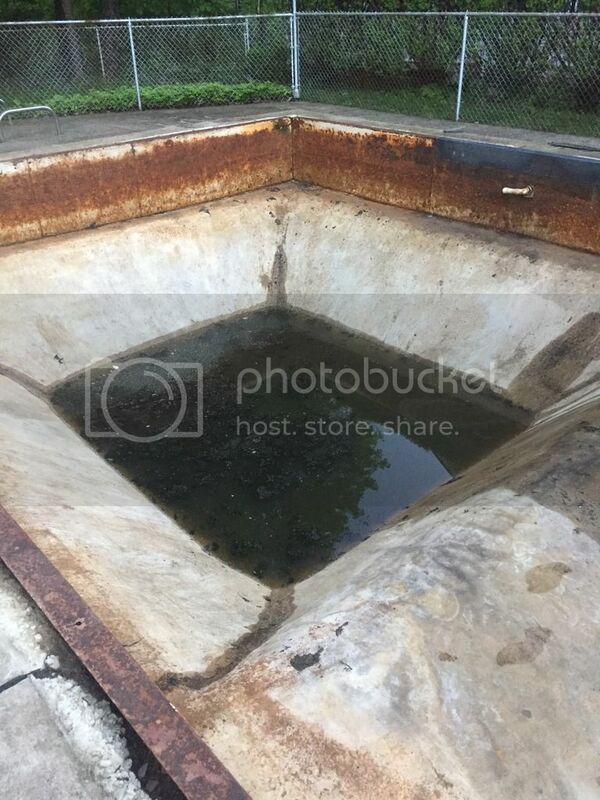 Can't wait to see how they did this pool! Ok. Phew I got the pics in. Now I know it's rusted bad. I'm not afraid of that. I'll make that look new again where the top sill is missing. But what do you call this style of liner and coping besides old and obsolete. Is it possible to put it back this way. I mean I worked since '76 when this liner was put in. This is SO outside my realm of experience it is not even funny but............we can piece it together to see what might or might now work. -walls are steel-are they rusted at all? 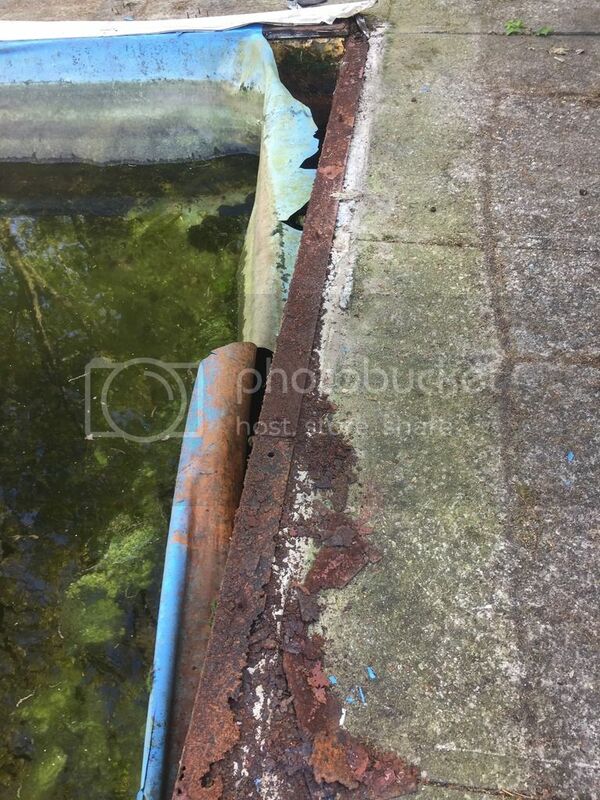 -the rusted pieces laying on the coping-how were they attached to the walls before? -The wood was attached to the rusted pieces? -The liner was "wrapped" around the board and attached how? What is under the cement/coping? How thick is the cement/coping? Yes the walls are steel they are rusty. 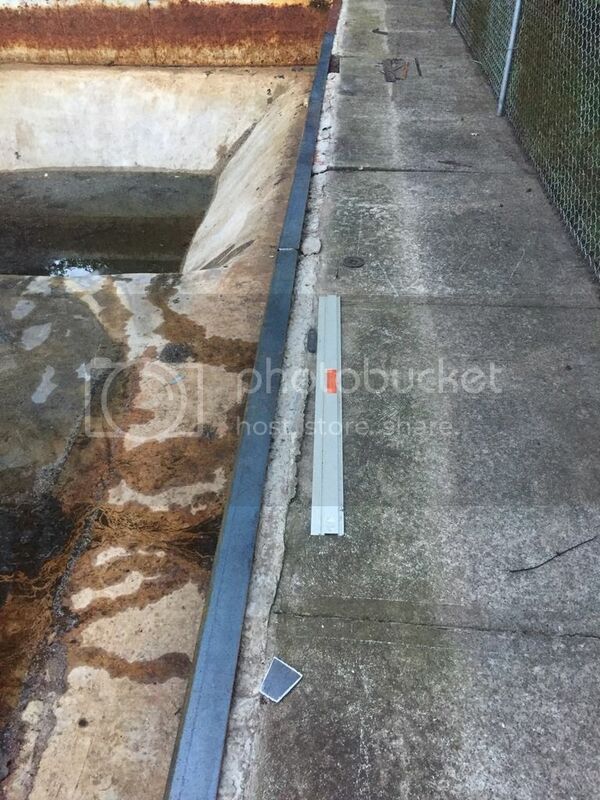 The rusted pieces laying on the concrete are part of the wall that came up and bent 90deg over the concrete decking. About 5.5 in. the cement deck deck is fine al the way around the pool. In the last picture that white strip fits over the liner covered board and is made of vinyl. The sides are also nailed to the board. Double lipped to cover the nails. I cannot find any info anywhere on this setup. It's to simple and cheap I guess. 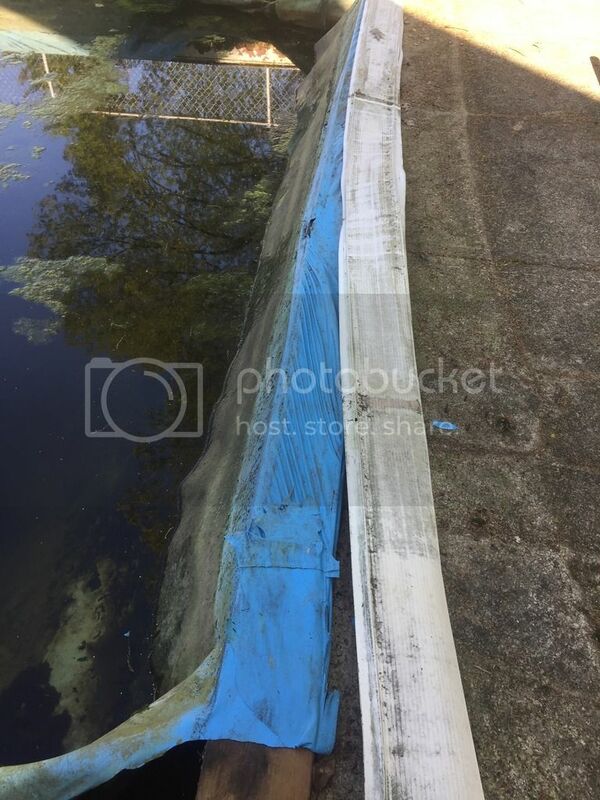 I know the coping is above the deck for a potential trip hazard but I grew up using this pool and it's never caused an issue. Man, this will be quite the project! Ill be watching, and wishing I could add some solid advice. Out of my realm of knowledge too. Our deck is under our coping rail so could be a tripping hazard as well but I like how it looks so........that is how hubby did it. Once you get that figured out you will need to do something to keep water from getting behind the walls. I am thinking flexible caulk or such. Do some searching and see what you can find. THEN you can work on a new coping to take the place of the wood.....many ideas out there. Bricks? small stepping stones? Once you pick what you want we can come up with a way to attach them! Has anyone seen this liner set up before ? ?